All you need to know about Quaid H-D is said in their Mission Statement: To provide the ultimate H-D experience for the individuals who make their own rules and know when to break those rules, for the individuals who define what they ride and wear but are not defined by it, for individuals who step out of line, hit the road and keep moving, our dedication is for the self-seekers who look around and understand that. Conformity Bites! As you can tell by their mission statement, they wanted to differentiate themselves. One of the best ways to do that is through marketing. Brandon Quaid, partner at Quaid H-D, recognized the Sharp Shooter Program as an opportunity to do that. Many traditional advertising reps (TV, Radio, Billboard, Print, etc.) tell you the goal of your marketing is to get your name out there and build your brand. Getting your name out there and building your brand shouldn’t be the core goal of your marketing. The one goal of your marketing should be to make the phone ring, door swing and cash register ding! Getting your name out there and building your brand are happy by-products of good direct response marketing which by definition, gets your exact target audience to take action on your marketing (A.K.A. call the store, walk through the door or generate a quantifiable sales opportunity for one of your departments) through an incentive combined with a deadline. Here’s how the Sharp Shooter Program accomplishes that; we start with the Right Target Audience, we hit them through the Right Media Channels, we use the Right Message and execute all of this with the Right Timing. When you hit on all four pillars, you drive a lot of qualified traffic through the doors and generate a pipeline of leads for each of your departments turning a weekend event into a month-long-sales-process. This allows you the opportunity to truly stretch your Return On Investment…which at the end of the day is why you spend money on marketing, right? We start with a combination of your past customers and conquest customers, or prospects who ride what you sell and live in the same area where the majority of your sales come from. The single best dealership in the country has a huge opportunity to reactivate customers who haven’t spent money with them in over a year and drive new blood through the doors. The loneliest number in marketing is 1. That’s why the Sharp Shooter Program utilizes up to 12 direct-marketing touches per campaign to guarantee the Right Audience has multiple opportunities to respond. And by simply giving them more opportunities to respond, we increase response drastically. Each piece of communication incentivizes customers (with a deadline) to tell us who they are, how to get a hold of them and what they want to buy from the dealership generating leads that will keep every department of a dealership busy for a month! Want to add to the white noise of all other marketing? Tell everyone you have great finance offers and huge rebates. Want to create affinity with you the group of customers where the majority of your sales are going to come from, maximize response, traffic and generate the most amount of leads? Throw a party and feature things your customers care about: Food, Drinks, Door Prizes, Music & Demo Rides. This is putting a bow on the whole package. When you have 12 different marketing touches happening in 10 days, it takes surgical precision with planning when it hits customers. We’ve got this down to a science and it truly maximizes each piece of communication’s potential response. Brandon at Quaid H-D has been implementing the Sharp Shooter Program consistently for some time now and the results speak for themselves. 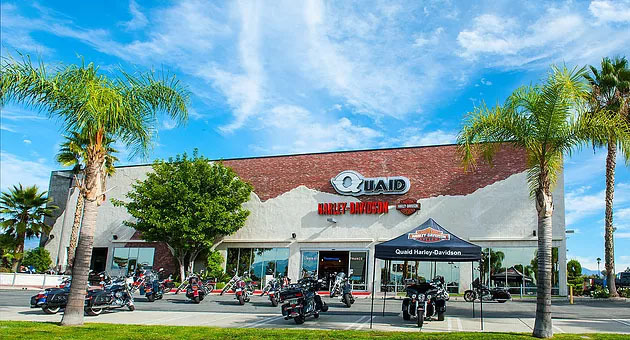 Check out what they were able to accomplish on their event this month, the “Quaid Raid”! 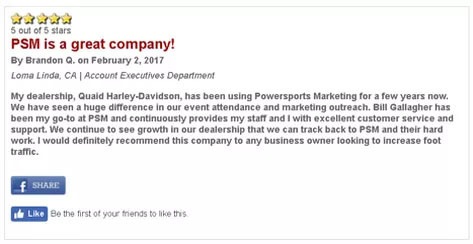 They had 209 surveys completed, which created a total of 160 sales opportunities in P&A, Service, and riding gear, PLUS 53 responses for a new or used bike. Check out the inserts for some killer campaign options for March & April and for more information on how the Sharp Shooter Program can help you achieve your marketing goals in 2017, call me on my direct line 877-242-4472 ext: 112. Happy selling.